The Orbiting Carbon Observatory's primary job is to see what's happening to the carbon dioxide levels in our atmosphere. There were plenty of striking things about February 12th's budget news, given that it contained lots of draconian cuts that were simultaneously restored because Congress had boosted spending the week before. But perhaps the most striking among them was an item in the proposed budget for NASA: Trump wants to block the follow on to a highly successful NASA mission. To truly appreciate just how awful this is, you have to understand the history of that satellite and what it means to the scientific community as a whole. So let's step back and take a look at why the Orbiting Carbon Observatory (or OCO) exists in the first place. It turns out it was built specifically to handle some outstanding questions of the sort that people in the administration say are important, and killing its successor would mean the existing mission never lives up to its full potential. With optimism, even as the current US administration cuts back earth science research and OCO-2 / OCO-3 missions are now at risk, we continue to point to the critical security role science research from space has in securing national and global security. The findings are published in the journal Science Friday as part of a collection of five research papers based on OCO-2 data. The OCO-2 mission greatly expands the ability to observe atmospheric carbon dioxide. OCO-2 collects high-precision, total column measurements of carbon dioxide (from the sensor to Earth’s surface) during daylight conditions. Scientists can use model results to understand and predict where carbon dioxide is being emitted and removed from the atmosphere and how much is from natural processes and human activities. Global temperatures have been on the rise, thanks largely to the human-driven increase in greenhouse gases like carbon dioxide. But not all of the carbon dioxide produced each year ends up in the atmosphere. Some of it ends up trapped in the ocean, or locked on land thanks to plants that use the gas during photosynthesis. “Now we can see that the tropical forest and plants didn’t absorb as much carbon as they usually do and that’s what caused this big increase in that time period,” Eldering explains. Drought and higher temperatures have been linked to the climate change fueled by greenhouse gases. Now, it seems that there could be a vicious cycle at work. The results should help experts develop more effective strategies to deal with climate change in the future. The findings come a few months after President Trump’s budget plan proposed to cut OCO-3, a follow-up mission that would continue OCO-2’s work. The Orbiting Carbon Observatory (OCO-2) team refines mission... OCO-2 will orbit closer to CloudSat and CALIPSO in the Afternoon "A-Train" of Earth-circling satellites. OCO-2 research team changes of OCO-2 orbit to enable pairing up one million daily measurements of carbon dioxide made by OCO-2 with cloud and aerosol measurements made by the other A-Train satellites. Instrument calibration and data reprocessing updates result in improved visualizations of how carbon is moving around the planet, as baseline data is gathered and studied. "Planet citizens/planet scientists" can now enter and utilize the Earth Observation open access database. A full Level 2 set of CO2 data was made available in March for scientists and the public "planet citizens" to download and explore. "Climate change is the challenge of our generation," says NASA Administrator Charles Bolden. "Watching the Earth Breathe from Space"
- Retrieve estimates of the column-averaged carbon dioxide dry air mole fraction (XCO2) on regional scales (1,000 kilometers or greater) from space-based measurements of the absorption of reflected sunlight by atmospheric carbon dioxide and oxygen, collected in cloud-free scenes at least 80 percent of the range of latitudes on the sunlit hemisphere at monthly intervals for two years. - Compare space-based and ground-based XCO2 retrievals from soundings collected during overflights of three or more primary ground validation sites at least once each season to identify and correct global-scale systematic biases in the space-based XCO2 product and to demonstrate a precision of 0.3 percent or less for collections of 100 or more cloud-free soundings. - Record, validate, publish and deliver science data records and calibrated geophysical data products to the Goddard Earth Sciences Data and Information Services Center for use by the scientific community. - Validate a space-based measurement approach and analysis concept that could be used for future systematic carbon dioxide monitoring missions. Message One: The burning of fossil fuels and other human activities are currently adding more than 36 billion tons of carbon dioxide to the atmosphere each year, producing an unprecedented buildup in this important greenhouse gas. 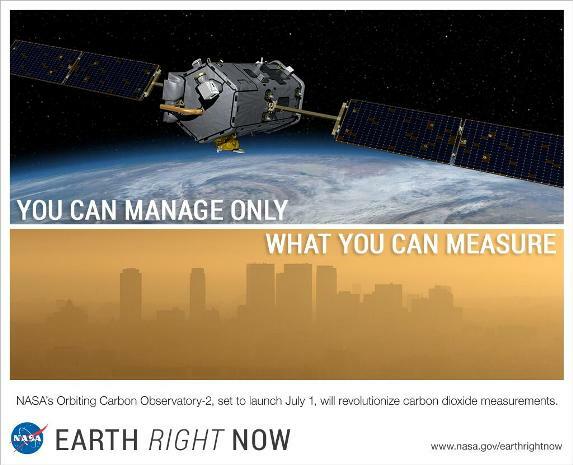 OCO-2 provides a new tool for understanding the sources of carbon dioxide emissions and how they are changing over time. Message Two: Less than half of the carbon dioxide emitted into the atmosphere by human activities stays there. The location and identity of the natural “sinks” that are absorbing the rest of this carbon dioxide are currently not well understood. OCO-2 will help solve this critical scientific puzzle. Sub-message: Knowing what parts of Earth are helping remove carbon from the atmosphere will help us understand if they will keep doing so in the future. OCO-2 measurements will help scientists construct better models to predict how much carbon dioxide these sinks will be able to absorb in the future. Message Three: The innovative technologies incorporated into OCO-2 will enable space-based measurements of carbon dioxide with the sensitivity, resolution and coverage needed to understand human and natural sources of carbon dioxide emissions and the natural sinks that control its buildup, at regional scales, everywhere on Earth. Sub-message: To control carbon dioxide in our atmosphere, we need to be able to measure it. We can only manage what we can measure. Message Four: OCO-2 will help assess the usefulness of space-based measurements of carbon dioxide for managing emissions of this important greenhouse gas. This page was last modified on 6 April 2019, at 19:57. This page has been accessed 26,170 times.